How can companies use geospatial risk assessment to implement their no deforestation commitments? In its third annual Forest 500 report released this month, the Global Canopy Programme assessed the commitments made by influential actors to address deforestation in palm oil, soy, cattle and timber product supply chains. Of the 166 palm oil companies assessed, more than 60% have sustainability policies and over 55% have forest policies. Companies are making new commitments to eliminate deforestation across a range of commodity supply chains. Between 2014 and 2016, the number of companies committed to addressing deforestation in all relevant commodity supply chains increased by 5%. All these companies need tools and processes to help them identify where deforestation occurs in their supply chains. And this is where geospatial risk assessments can help. What are geospatial risk assessments? Widely used methods take recent trends in deforestation, peat clearance or fire in an area and use this information to calculate the probable future risk of such damage. 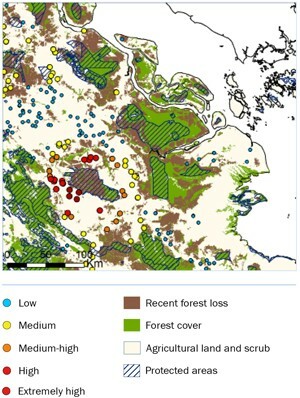 Companies buying or trading palm oil can use geospatial risk assessment to help them identify specific palm oil mills and clusters of mills in their supply base with a highest risk of deforestation or fires for forest clearance, including on peat or in protected areas. It’s a tool to highlight the places where companies should look more closely if they want to fulfil their policy commitments to eliminate deforestation from palm oil supply chains. Because, once identified, companies know where to focus their efforts to improve production practices, help mills to avoid further deforestation and promote responsible palm oil production. Currently geospatial risk assessment is limited to indicators for which we’ve got relatively good spatial data. As more types of data become available it will give indications of the risks for other issues — for example, land tenure has recently been incorporated into one such tool developed by IAN. Other social and environmental risks may be added as the data sources become available. The techniques are also likely to be expanded to other commodity supply chains: it has already been used to assess risks around sugar mills. Read our new Responsible Sourcing and Production Briefing 06: Geospatial risk assessment and ‘no deforestation’ commitments. Independent organisation helping industry, governments, NGOs and communities manage the world's natural resources sustainably.